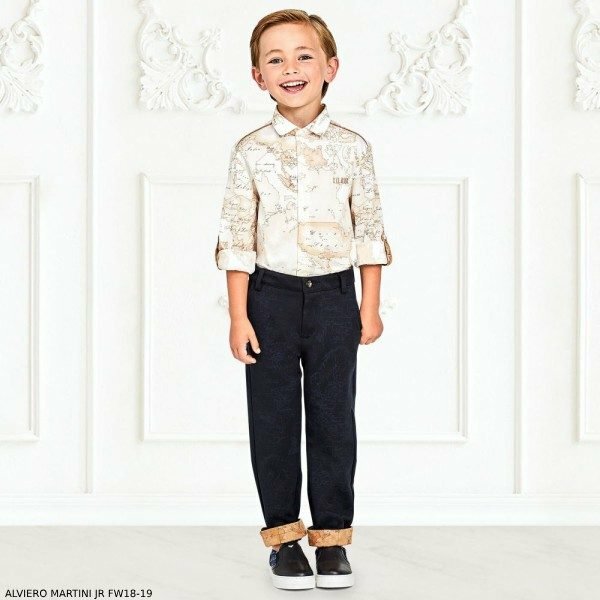 Love this special occasion look for boys – ALVIERO MARTINI Boys White Geo Map Shirt & Navy Chino Pants. Every boy needs a white shirt in his wardrobe, especially one with a twist, and this Alviero Martini design fits the bill. Made in pure white cotton, this classic ivory shirt for boys by Alviero Martini is patterned with the designer’s signature Geo Map print in beige. Comfortable and smart, it has dark beige trim and embroidered logo on the chest. Complete the look with a pair of boys smart navy blue trousers for boys by Alviero Martini, made in a soft and stretchy viscose blend jersey. 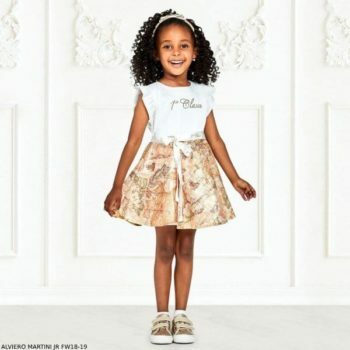 They have the designer’s signature Geo Map print, with beige print trim on the leg turn-ups and back pocket. Shop Online. Ships Worldwide.